Apartment N. 268: It can accommodate up to 2 people, it is rented from 107 € per Night (not per person). 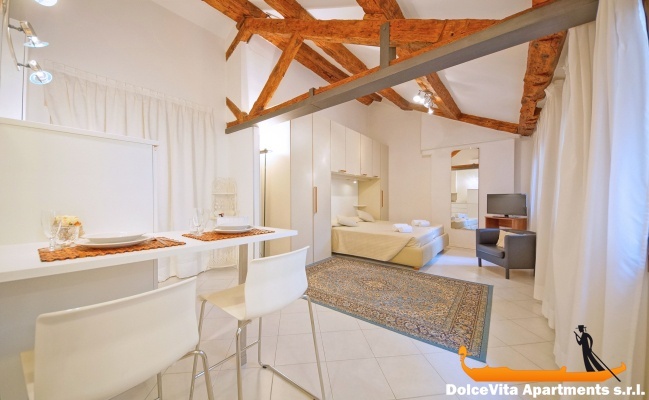 Lovely Holiday Apartment in Center of Venice for 2 People: Comfortable studio of 30 square meters in the heart of Venice. This apartment is located in the Castello area, just 4 minutes walk from the Rialto Bridge and 5 minutes from St. Mark's Square. 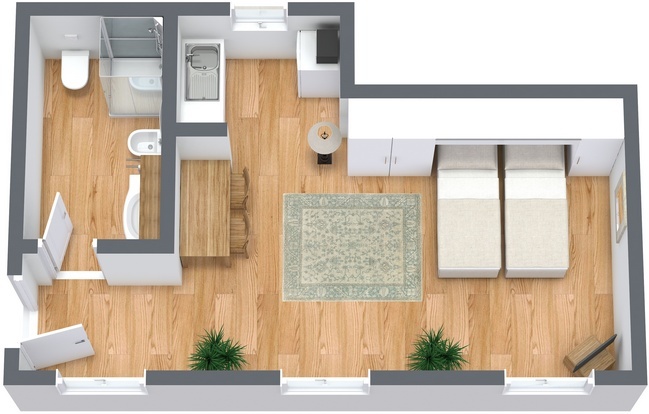 It is on the third floor and it can accommodate up to 2 people. 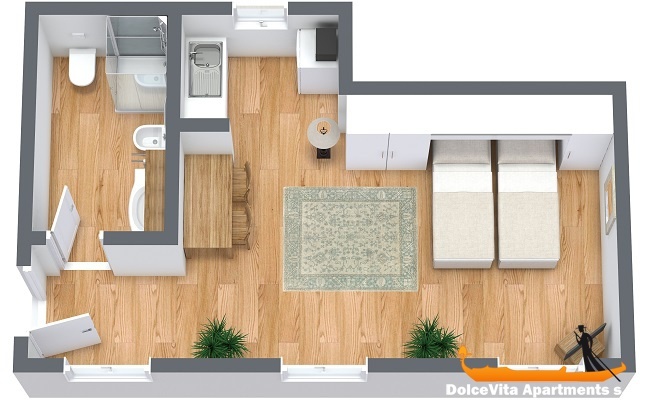 It consists of a single room which includes a bedroom with two single beds (which can be connected to each other) and a small corner with: microwave, kettle, fridge and sink. A beautiful bathroom with shower completes the studio. There are also Wi-Fi, air conditioning and heating. Upon arrival, guests will find the apartment equipped with bed linen, blankets and towels. On request, there is also a baby cot. 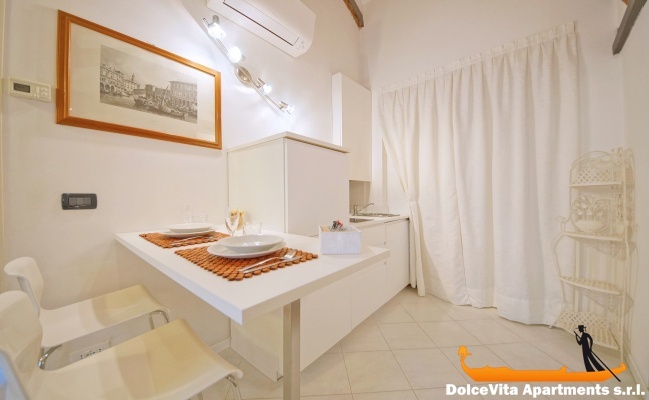 Thanks to the strategic position, during your stay in this apartment, you can visit the center of Venice on foot and for excursions to other areas (railway station, Murano, Burano, Torcello, etc. ), the vaporetto stop from Rialto is 400 meters away. We also remind you that a few steps from the apartment there is a Coop store. The appartment is very clean, very nice, and comfortable.the place is very good : 5’ from the Rialto bridge, and 5’ to the St MArc place. It may be lack of hotplates to prepare a meal. We easily met Mr. Gianni and enjoyed having the apartment a little earlier than expected. We would have liked to have some good addresses (restaurant, shopping, etc ...). Unfortunately, we do not have a picture of us. Very pretty and comfortable, central location. Very warm welcome from Carlotta who gave us all the information about the city, transportation, restaurants.